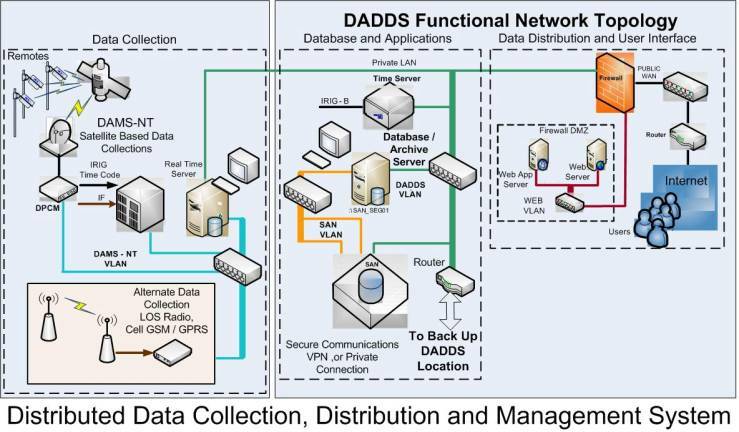 DADDS (DCS Acquisition, Direction and Distribution Systems) is the Data Management and Distribution functions for wide area environmental networks. The diagram below shows all the elements associated with a WAN for environmental data collection. The DADDS is composed of hardware and software elements. The topology diagram above is descriptive of the hardware organization. The left major sub block is the data collection communications. More than one communications mode can be supported. The GOES (and related satellites) DCS section is the either the DAMS-NT or DigiTrak direction reception system. Other communications management for Line Of Sight Radio (ALERT-IFLOWS), GMS / GPRS, or IP protocol networked systems is available. All elements of the design are based on the idea of distributed processing. There are three sub Local Area Networks (LANS) that are associated with Data Acquisition communications, Database and processes, and Internet Distribution and User Interface. The central database LAN connects to the Data Communications and Internet blocks. The Internet web user interface is user name and pass word protected. Privileges are assigned based on a hierarchal assignment of the user sign in name and password. The DADDS is built around MS SQL database and MS Server Operating Systems. All other processes either draw from or source (or both) from this database. A diagram of this design is shown below. The DADDS may be configured to provide a number of approaches to achieve very high availability. The first approach is to provide redundant capability for all functions with auto fail over. A further separate approach is to use a second site in a geographically separate location. The Prime and Backup site are maintained in synchronism via replication methods. A secure communications path is needed between the two sites. If a site is disabled the other operates in a normal mode. When the disabled site is reengaged the disabled site is brought into synchronism with the operating site. The hardware implementation is based on the multiple servers. These servers may be housed in a single blade type server cage such as available from a number of vendors. A number of optional applications packages may be used with DADDS. These include packages such as Aquatics Informatics, DataWise, and Datapoint. Physical models may be also be run within this DADDS using either raw data or data processed by earlier data management applications. DADDS is organized on a site and user basis. Site tables (known as Platform Data Tables) use individual ID codes that are uniquely assigned. Information fields in these tables include sensors, message structure for decoding, site location, communication parameters such as reporting time and interval. The User tables include fields for User Name and Password that are tied with User privileges as well as other user information. One example is that a user in a specific region has access to all data but is permitted to change or add site information (PDT tables) in station associated with his region. Application programs have access to the engineering values as soon as they are received from the remote sites. Site data tables would have additional fields that are filled in by applications that use the site engineering value data to derive computed information. Atypical example is the derivation of stream flow data from water level.